At the CRESC 2014 conference I presented a paper on the ethnography I carried out as a volunteer in a charity shop in Cheetham Hill, North Manchester. The subject of the conference was Power, Culture and Social Framing. It made sense to focus on the concept of charity and how it was in itself a discourse that had been framed and (re)framed over the centuries leading to the creation of charity shopping as we know it today. I began the presentation by tracing the emergence of charity as a concept to William Booth and the Salvation Army in the 19th century (although I’m sure charity not as we know it could be traced much further back). The Army set out on a religious crusade in the mid-1800s to ‘elevate the submerged’ and to offer ‘spiritual contact and a new insight into a better way of life’ for those in living in extreme poverty on the streets of London and those at risk of moral danger (William Booth cited in Horne 2000 and in Horne and Maddrell 2002, p. 3). The Army’s crusade moved from providing food and shelter, to the opening of stores in London and then expanding to other urban locations throughout the UK, selling salvaged goods collected from the middle classes (described as ‘waste commodities’ by Booth 1970), in the early 1900s. Booth’s aim was to ‘ease the living conditions of the poor and at the same time proclaim the Gospel of Christ to all who came into the shops’ (Horne and Maddrell 2002, p. 3). The post-war era saw major growth and development across most of the UK, and the establishment of the welfare state. The most rapid expansion in charitable retailing was in the 1980s, where, under a Conservative government, social services faced cuts, which not only led to some members of society relying more heavily on charity shops to purchase everyday items at a low cost, but also to non-profit organisations being in receipt of fewer grants and donations (Horne 2000 and Maddrell and Horne 2002). Charities had to negotiate their fundraising revenues and eventually ‘charity retailing proved to be one of the most popular trading activities for raising money’ for the parent charity (Horne and Maddrell 2002, p. 5). Shops began to emulate the practices of first cycle retail spaces and consumption practices, resulting in them being less homogenous spaces for participation (Gregson and Crewe 2003, p. 44). The blog turns into a Lonely Planet-esque guide to charity shopping, locating the best shops in England and Scotland in which to browse to find high quality clothing of cultural ‘value’ (as in designer pieces) at a good price (in fact, the charity shop section on the Salvation Army Website reads: “We’ve been known to have the odd Prada and Balenciaga come through the doors (and go out just as quickly!)”). This is the beginnings of charity shop tourism perhaps, as a member of the presentation audience suggested. The shops referred to in this blog are located in areas of considerable affluence. Is charity shopping becoming an acquired and distinct practice? It seems to have become cultural in that it has become fashionable. But in my presentation I was asking: cultural and therefore ‘fashionable’ for whom? 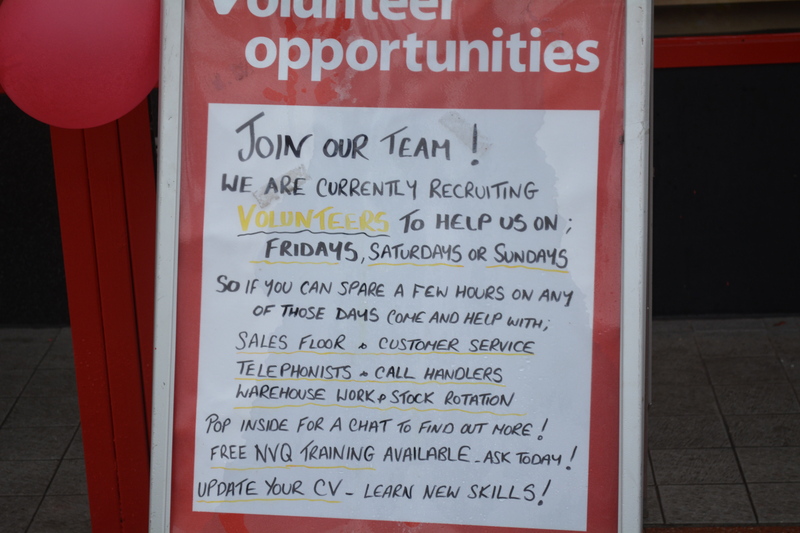 This became the point when I began to share my experiences as a charity shop volunteer in Cheetham Hill. I wonder whether anyone has thought about or asked what this (re)framing of charity shopping as a cultural/fashionable practice means for shops not located in the Northern Quarter or the cultural quarters of any UK city, but those in neighbourhoods on the outskirts of the centre, in areas of diversity and liminality like Cheetham Hill. And what affect this shift or (re)framing will have on the concept of charity in charity shops and participation in the future and their impact on the creative economy? 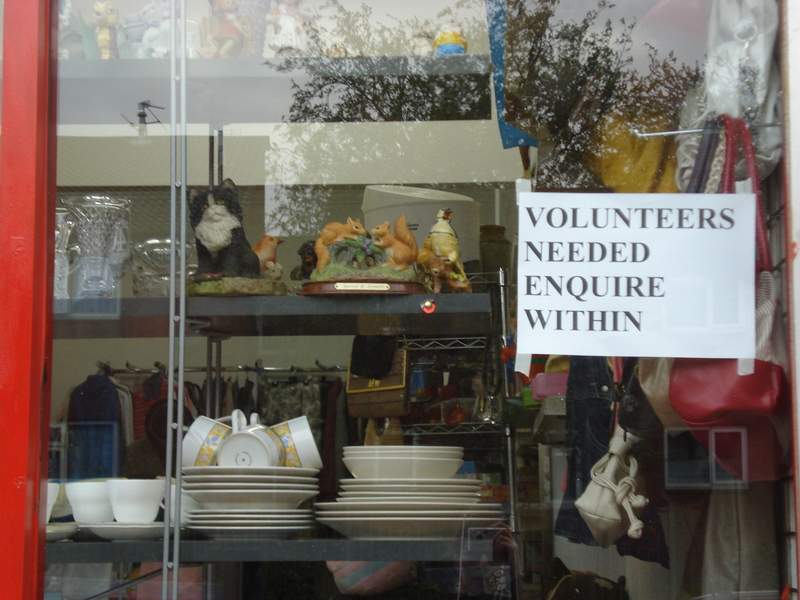 Although charity shops are not yet directly part of this economy, second hand cultures are in the form of second-hand/vintage entrepreneurs; those who source and purchase second hand goods, sometimes from charity shops and re-sell them (Gregson and Crewe 2003). Rendering charity shops as invaluable places that enable this small part of the creative economy to thrive. Having a chat with [manager] today she told me about which items were considered, from above [head office] as being “too good” for Cheetham Hill. “Anything from M&S, Monsoon, places like that, we’re told is too good for Cheetham Hill and so it’s taken to a better store,” she told me. The manager told me a similar story, about when the area manager who was on a store visit noticed one of the bric-a-brac items (a crystal ornament), which she decided should not be for sale in the Cheetham Hill branch because it was of a “high quality” and could be appreciated and sold at a higher price elsewhere in Manchester. She took it with her when she left. Cheetham Hill and its customers have been identified as undeserving of higher value (economic and cultural) items, which limits participation in the shop and inevitably limits the shop itself. The shop had recently become a discounted charity shop, which means that all items were marked at the same low price. This infuriated the manager and came to incense me also. For the Manchester-Salford case study I was witness to a range of participations and participants as well as being a co-participator myself. Charity shop participants consist of paid workers, volunteers, customers and donors, with these identities and positions shifting and merging continuously. I volunteered with people who were participating in order to learn new social and interpersonal skills (such as practising the English language) and those whose participation was a stepping-stone to getting a job in a “real” shop. I served customers who would come in everyday to purchase an item or just for a chat and leave empty handed and those who did not pay for items at all. On a daily basis I saw people struggling to pay for items and who would barter trying to get a lower price (did they know it was a charity shop I would continually ask myself). I accepted donations from people who knew the value of the items they were donating and those who did not. For the majority of volunteers and customers the charity shop in Cheetham Hill is an enabling space that allows them to consume and be a part of a wider set of practices. It is a safe space, a welcoming space for those unable to travel to and shop in the centre of Manchester because of barriers (real or felt) that perhaps are social, cultural, ethnic or economic. In the afternoon I served two young women (maybe 20s early 30s) who spoke with thick Mancunian accents […] whilst one was at the till purchasing children’s clothing and a woman’s t-shirt, her friend shouted over about a pair of “skinny jeans” that she liked and which were “well in fashion at the moment”. […] She brought them to the till to buy and told me again about how expensive they would be in a “normal shop, like Topshop” and how “everyone is wearing these at the moment”. Charity shopping in Cheetham Hill is very complex and is steeped in a whole range of spatial and cultural participatory politics. It is a form of everyday participation that is experienced and constructed differently by different customers, volunteers and workers. Both these customers are constructing and carving out identities for themselves through consumption and are attaching different values to their participation. One as a father and the other as someone who likes to follow the latest fashion, but who made it clear that she could only participate because it was a low priced item, in a particular space of consumption. What my observations as a volunteer in Cheetham Hill suggest is that people do shop there because of their economic circumstance. However, the processes and negotiations they conduct within the space (such as engaging practices most familiar in first cycle retail spaces), the shopping place (re)constructed by these customers’ participation needs further investigation. Other customers choose items that display their taste for the current fashion and the shop holds some form of cultural value for them. The ‘poor’ consumer is no longer a homogenous category, but made up of individuals who attach a range of values to their participation in charity shopping. Thinking and writing about how charity shops have been framed and subsequently (re)framed as spaces of second-hand cultures for the conference has made me imagine what would happen to the workers, volunteers and customers I met, if the store ceased to be. This particular charity shop is already a victim of this shift. Its new founded status as a discounted charity shop is a warning. It would not surprise me if the shop were to close in the near future, because it rarely hits the weekly takings target set by head office. Being at the bottom of the shop hierarchy means that it is slowly being pushed out by these ‘elsewhere’ shops that have a superior variety of stock selling at higher prices. This is a real shame because the charity shop in Cheetham Hill is a primary space for social contact and interaction for many of its participant-customers. The value in participating for them exists in the sociality the shop provides. It would be unlikely to find these customers traveling to the city centre and even less likely to the Northern Quarter, to browse charity shops that they would find too expensive (the economic and cultural value is too high). What would happen to the little social capital these customers have if such spaces ceased to exist in areas like Cheetham Hill? My question and, I suppose, conclusion of my presentation which I wanted the audience to ponder, is whether the more culturally valuable charity shops become, the more exclusionary they are and those who are excluded tend to be those customers, participators, identified by William Booth over a century ago, who need such spaces and practices the most. Gregson, N and Crewe, L. (2003). Second Hand Cultures. Oxford: Berg. Horne, S. (2000) The charity shop: Purpose and change. In International Journal of Nonprofit and Voluntary Sector Marketing, 5 (2), p. 113-124. Horne, S and Broadbridge, A. (1995) Charity shops: a classification by merchandise mix. In International Journal of Retail & Distribution Management, 23 (7), p.17-23. Maddrell, A. and Horne, S. (2002) Charity Shops: Retailing, Consumption and Society. London: Routledge. Williams, C. (2003) Participation in alternative retail channels: a choice or necessity? In International Journal of Retail & Distribution Management, 31 (5), p. 235-243.